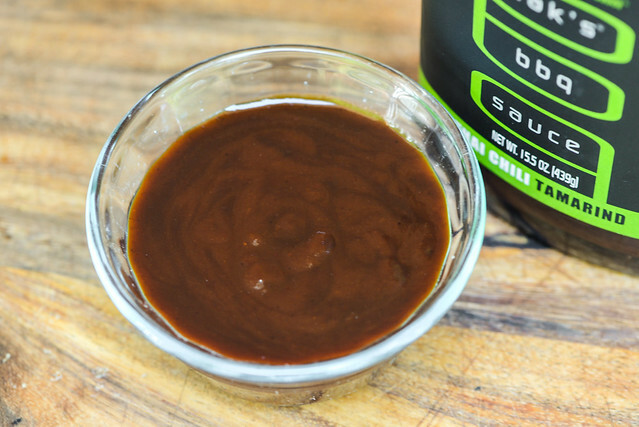 Tamarind lends a unique flavor to this sauce, also upping the sourness to create a very tangy profile that's backed up with a good kick of heat. This past summer I spent some time in Thailand and experienced one the most amazing sauces I've ever had—an extremely savory sweet and spicy dipping sauce with slightly sour notes from tamarind that went great with the crispy gai yang it accompanied. 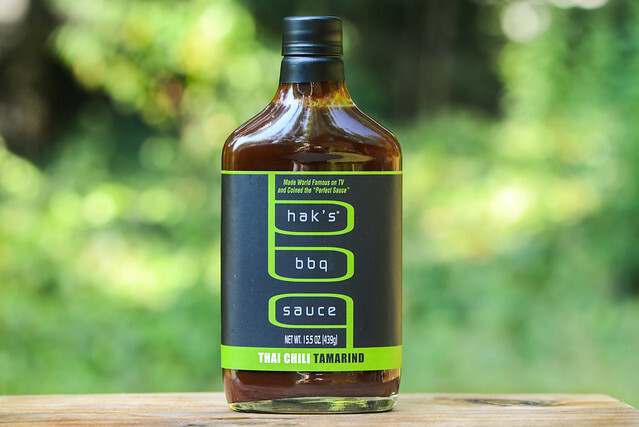 When I saw this bottle of Hak's Thai Chili Tamarind at the grocery, it invoked memories of that sauce, and while I knew it would be something ultimately totally different, that reminiscence was enough of a driving force for me to pick it up. Hak's gets its name from its creator, Sharone Hakman, who, after working as a financial planner, took the plunge into following his true love of cooking. This adventure brought him to an appearance on Fox's MasterChef in 2010, where he impressed the judges with his barbecue sauce. This led Sharone to take his sauce to the next level, serving it in other competitions as well as bottling it and expanding his sauce offerings, which today has five different varieties. Despite boasting a Thai profile on the label, the aroma of this sauce starts out in a fairly standard fashion. There's an upfront molasses sweetness with some vinegar tang to back it up. There's also a strong tomato component, which has a common ketchup-like character. Upon a few deeper whiffs, the unique sour smell of tamarind does make its way in along with a little earthy pepper that doesn't really add heat to the aroma. This maroon sauce has a semi-glossy sheen and also has a very slight texture to it. It's totally opaque, which makes it hard to see any spices except a few specs of black pepper here and there. Its thickness straddles the exact center of the scale, and from a suspended spoon, the sauce falls in quick, uninterrupted pour at first. This stream gives way to fast drips once most of the sauce has left the silverware, and after the last couple slow drips release, a medium coating of sauce is left clinging. This sauce starts out with a deep, acidic tomato flavor. As it settles on the tongue, a wave of molasses adds some complexity, but not sweetness as things quickly turn more tart. There are a lot of layers to that sourness though, with tomato and vinegar being the first to make themselves known, then the tamarind kicks in and adds a hint of Thai flavor. Next, chilies come into play with a little earthy undertone that soon ramps up to a pretty scorching heat. This leaves a super tangy burn lingering in the mouth after all is said and done. The sauce coated the chicken in a medium, uneven layer that baked down fairly well over indirect heat. When moved directly over the fire, there was a little caramelization as well as a bit of burn off that required more sauce to be applied at the end. 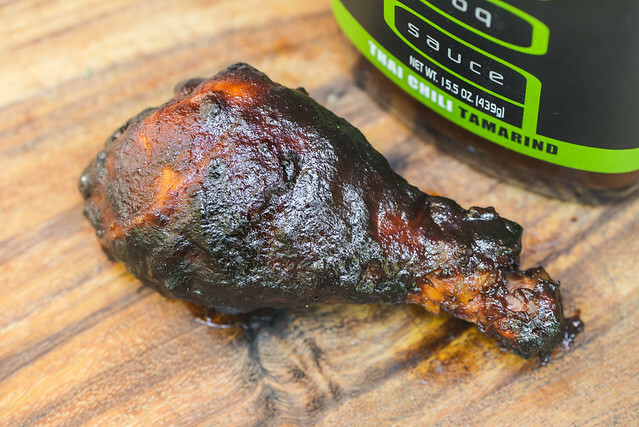 While the flavor was plenty tart out of the jar, it just got more sour after being cooked. That tamarind component popped more, but that enhancement came at the cost of what little sugar there was adding a bit of balance in its raw state. The heat backed down a bit, only creating a medium burn after multiple bites of the leg. While I had no expectations that this sauce would taste like that excellent tamarind one I had in Chiang Mai, I was left wishing Hak's Thai Chili Tamarind had some of the sweet, spicy, and sour balance I was hoping for. This sauce certainly brought the spicy and sour, along with the tomato and molasses you'd expect in a barbecue sauce, but it felt like it lacked some needed contrast in sweetness, which allowed the acidity to really dominate all else, with the exception of the strong hit of heat right at the end. This feeling was multiplied after being cooked, leading me to enjoy the sauce a bit more out of the jar. This is not to say that an extra tangy sauce isn't good, it just felt like something was missing here that would have pushed it into a higher realm for me personally. It was, however, a pretty unique flavor thanks to the tamarind, so if you're looking for a sauce that's going to shake things up from the norm, this one may be worth a try. Sorry to hear that this sauce wasn't quite up to par. I guess it leaves you open for the challenge of coming up with your own Chili Tamarind sauce recipe. I can't wait to see what you come up with!